Allan D'Arcangelo began his studies interested in history and government, but eventually switched to art. He was born in Buffalo, New York in 1930, and he attended the University of Buffalo, the City College of New York and the New School for Social Research. 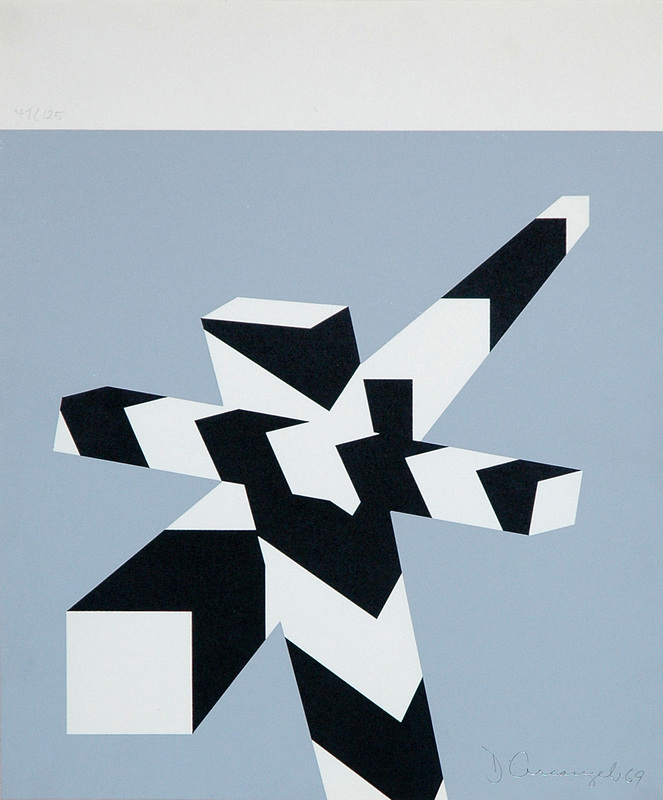 In 1957, D'Arcangelo went to Mexico City College, where he studied under John Golding for two years, and where he had the first exhibition of his work in 1958. He has taught at many institutions, including Brooklyn College and the School of Visual Arts in New York City and the Institute of Humanistic Studies in Aspen, Colorado. In 1964, he was commissioned to paint the mural for the Transportation and Travel Pavilion at the New York World's Fair, and in 1967 he was commissioned to paint a mural on the side of a New York building, one of the first instances of outdoor murals in New York City. He won the National Institute of Arts and Letters Annual Award in 1970 as well as painting a poster for the Olympic Games in Munich, also in 1970. More recently, he won a Guggenheim Fellowship (1987-88). 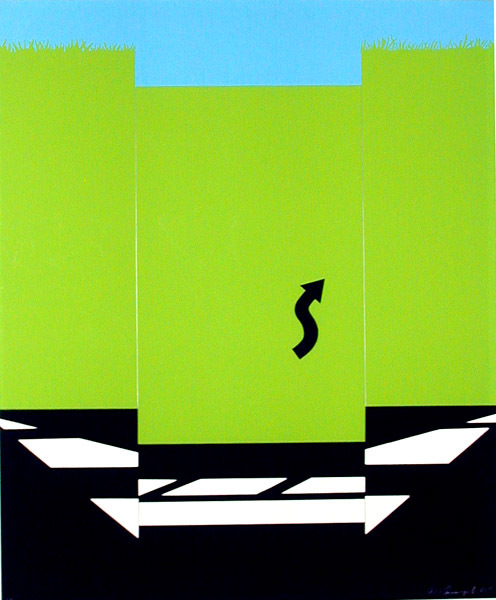 Allan D'Arcangelo is best known for his paintings of the highway, which he began in 1963. These paintings, typically flat planes with a perspectival highway extending into the distance. Often the highway was surrounded by the logos of gas stations and other highway signage, floating, disembodied, on the background. Early in his career, he made a name for himself as part of the Pop movement, with works such as Marilyn and Madonna and Child, from 1962 and 1963, respectively. Some of the characteristics of Pop are retained in his highway paintings, particularly the use of popular brand name logos, and the expanses of flat color. However, as the highway paintings evolved, they moved away from Pop art. D'Arcangelo's paintings became much more abstracted, sometimes reduced to a stylized traffic barrier repeated at different angles. Also un-Pop like was the inspiration for these highway paintings, coming from childhood memories and a desire to distill memory down to its simple, essential forms. Perhaps the most interesting part of the paintings are the contrasts: the flat picture plane and the one point perspective highway receding beyond the picture plane, the real and the artificial as seen in the use of color, light and shape, and the abstract and representational. These contrasts are found in the acrylic painting, Untitled (Dam), that D'Arcangelo did for the Bureau of Reclamation. He uses perspective to depict the tower, which is placed off center in the painting, so the viewer's eye is drawn back to the vanishing point, and then along the rest of the structure, off the edge of the painting. The eye is drawn back to the painting by the large red basket object. The red basket and most of the rest of the elements in the painting are rendered quite flat, with large areas of undistinguished color. Some sense of depth (beyond the use of perspective on the tower) is achieved by the layering of the cables in front of the dam structure. There is also a stark contrast in light and shade. Like the highway paintings this is a mechanized or technological landscape in which some elements are rendered more believably than others; a mixture of abstract schematic diagrams and representation. Although he has not shown as much as some of his peers, D'Arcangelo has had a number of one-person shows and been included in some important group shows, such as the 1964 American Landscape Painting exhibition at the Museum of Modern Art, New York and the exhibition American Art since 1945, also at the Museum of Modern Art. He was also included in the 1963 show Popular Imagery at Sarah Lawrence College, Pop Art U.S.A. at the Oakland (CA) Museum, The Popular Image at the Institute for Contemporary Art, London, The New Realism at the university of Massachusetts at Amherst, Mixed Media and Pop Art at the Albright-Knox Museum in Buffalo, Three Centuries of Popular Images at the Des Moines Art Center, Comparaisons at the Musee d'Art Moderne, Paris, Pop Art at Ohio State University, Le Nouveau Realism et Pop Art at the Musee Municipal at La Haye, Holland, Pop Etc. at the Museum des 20 Jahr Hunderts in Vienna, the Sixteenth National Print Exhibition: Two Decades of American Prints 1947-1968 at the Brooklyn Art Museum in 1968, Printed Art: A View of Two Decades at MoMA (1980). Among his solo shows, once finds one-person exhibitions at the Long Island University, New York, the University of Connecticut, a show at Ileana Sonnabend in Paris (1965), the 1967 São Paulo Biennale and a one-man exhibition at the Wurttembergischer Kunstverein, Stuttgart. In 1969 he exhibited at the Gegenverkehr, Aachen. He was also featured in Allan D'Arcangelo: Paintings 1963-1970 at the Institute of Contemporary Art, University of Pennsylvania, Philadelphia and at Marlborough Gallery (NYC) in 1971. He also had a one-person exhibitions at the Neuberger Museum, in Purchase NY in 1978 and the Virginia Museum of Fine Arts, Richmond, in 1979. Among the museums who include his works in their permanent collections are the Museum of Modern Art (NYC), The Guggenheim Museum (NYC), The Brooklyn Museum (NYC), The Detroit Institute of Art, the Boca Raton Museum of Art, and the Walker Art Center (Minneapolis). Selected Bibliography: In addition to discussions of d'Arcangelo in such standard works on the POP Art Movement as Judith Goldman, The Pop Image: Prints & Multiples (NY: Marlboroush Graphics, 1994), Marco Livingstone, POP ART: A Continuing History (NY: Abrams, 1990), and Tilman Osterwold, POP ART (Cologne: Taschen, 1991), see N. Calas, Allan D'Arcangelo (Paris: Galerie Ileana Sonnabend, 1965); Allan D'Arcangelo (text by artist), Allan D'Arcangelo: Paintings of the Early Sixtie (Purchase, NY: Neuberger Museum, 1978); Institute of Contemporary Art, Allan D'Arcangelo: Paintings 1963-1970 (Philadelphia: Institute of Contemporary Art, 1971); Marlborough Gallery, Allan D'Arcangelo (NY: Marlborough Gallery, 1971); Marlborough Gallery, Allan D'Arcangelo (NY: Marlborough Gallery, 1975). Landscape I. Original color serigraph, 1965. 200 signed & numbered impressions + 50 H.C. for contributors (numbered I/L-L/L) for the portfolio, 11 Pop Artists I. Included in Judith Goldman, The Pop Image: Prints & Multiples (NY: Marlborough Graphics, 1994). One of the classic POP prints. Image size: 610x504mm. Price: SOLD. April. Original color serigraph, 1969. 125 impressions signed and dated in pencil lower left & numbered in the white area across the top just above the grayish-blue area on the left margin. Our impression is n. 47/125. One of the d'Arcangelo's long series of abstract highway markers. Image size: 356x298mm. Price: $750.